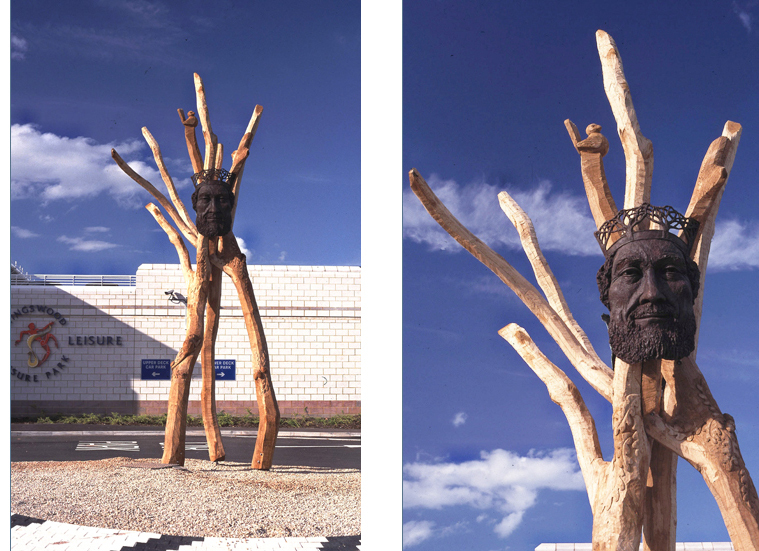 The sculpture is formed from three, six metre oak branched sections. They form a tripod meeting at 3.5 metres above ground level. The top section opens out into further branches, with carved areas depicting leaves and wildlife at the branch nodes. The sculpture is placed on a small roundabout on the centre’s main entrance road. A bronze mask of a mature king one metre high is fixed on the side of the sculpture facing the road in, on the other side is a mask of a young king, which faces the car park. The older King’s crown is formed from winter trees whilst the young King’s crown shows trees in leaf. A schools day trip was organised to the site where the artists gave the pupils a slide talk in one of the cinemas and demonstrated practical techniques used in making the work. The schools then developed arts projects based on the day which were later exhibited at Aspects Leisure Centre.